Marks & Spencer is to trial a liquid nitrogen-powered chilled trailer from Dearman. 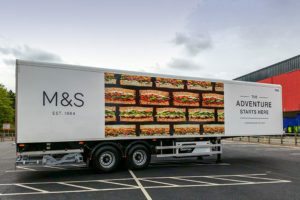 Dearman will supply Marks & Spencer with a dual compartment Dearman Hubbard fridge unit on a on a refrigerated semi-trailer. This will be operated out of its Hemel Hempstead depot. The venture seeks to quantify the costs and environmental benefits of Dearman’s technology, eventually leading to a nationwide roll-out. It is also a logical step for Marks & Spencer’s after the launch of its new sustainability plan Plan A 2025 last year. Dearman is “delighted to be launching a partnership with a real heavyweight on the UK high street,” said CEO Scott Mac Meekin. Dearman’s liquid nitrogen-powered engines are zero emission. They replace diesel-powered secondary engines in transport refrigeration units (TRUs). This system can cut CO2 emissions by up to 95 per cent when compared to a conventional diesel-powered TRU. Dearman has also partnered with Unilever to trial the performance of its technology. In that trial the Dearman technology outperformed diesel both on economic and environmental grounds.